As we explored in The ABC’s of Poaching, one of the easiest ways to rack up points and keep your counterparts on their toes in a doubles match is to master the art of poaching–the act of aggressively putting away a ball in response to a poor shot from your opponent. Here are some approaches to poaching that are sure to infuriate your opponents and help you clinch a victory. Typically, poaching is done in one of two cases: when you or your partner can anticipate a weak return, or in responding to a weak return by moving across the net and putting the ball away. Many players choose the second option, but developing the ability to anticipate a weak ball can greatly sharpen your game. Positioning yourself about a quarter of the way up to the service line, in the middle of the service box, can serve to both intimidate your opponent as your partner serves and leave you ready to poach. Be sure not to get too close to either the alley or the net. Widening your stance and lowering your center of gravity, you’ll want to act when you are able to deliver the return to the feet of the player closest to the net. The Australian Formation consists of both players standing on one side of the court, and is quite effective in disrupting the opposing team’s return of serve. It’s a great technique for blocking the cross-court shot most often used to return a serve in doubles matches, as it forces opponents out of their comfort zone into returning a fore- or back-hand shot down the line. A variation in Australian formation, this tactic is best used when your opponents are serving consistently well. By lining up in the center of the court and then splitting in opposite directions while the receiver is returning the ball, you introduce an element of surprise and distraction, enabling you and your partner to better control the point. In this formation, the server is standing near the center point of the baseline while their partner crouches over the center line of service (to gain a clear view of the court). Once the ball has passed over the server’s partner, he or she moves diagonally forward to the ad or deuce side, while the server handles the opposite side of the court. The result is a confused, distracted opponent and an opportunity to gain momentum in your service return. Much of the time, poaching is done by the receiving team. Your partner hits a killer serve, causing a poor return from your opponent which you move toward and deftly put away. The point is yours! However, a receiving team can also poach successfully with a little bit of planning. In this case, look for the moment when your partner hits a return that puts your opponents on the defense and sends their return back across the court. If you can anticipate this shot, and move slightly before the ball is hit, it will gain you an easy volley or overhead. The trick is to play the odds, anticipate, and act. 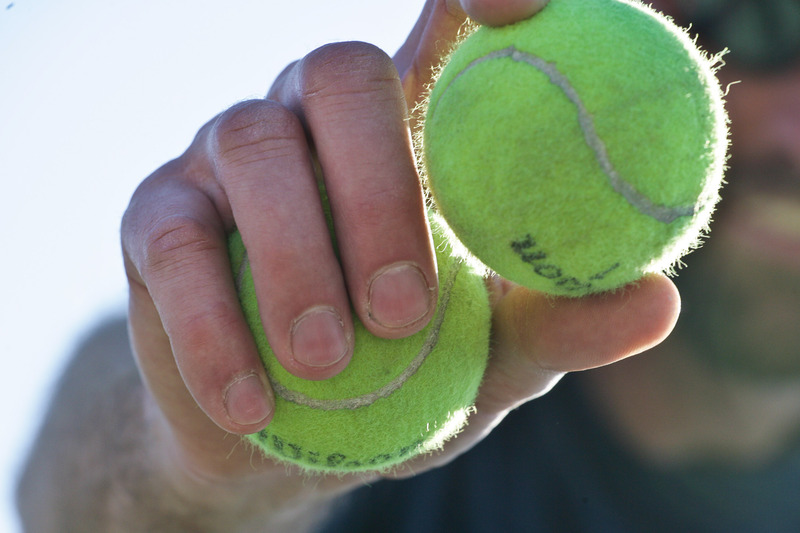 Try out these disruptive tricks to gain the upper hand in your next doubles team, and have fun! When you’re ready to tighten your game up on the court, contact me and let’s schedule your next lesson.